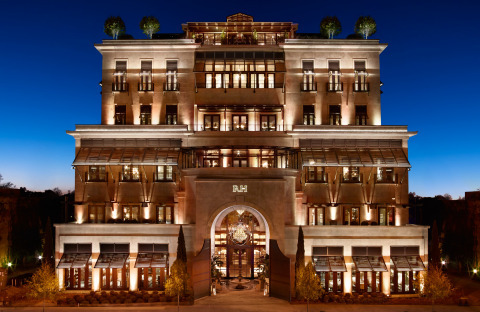 CORTE MADERA, Calif.--(BUSINESS WIRE)--Dec. 1, 2014-- RH (Restoration Hardware Holdings, Inc.—NYSE: RH) announced today the opening, on November 21, of RH Atlanta, The Gallery at the Estate in Buckhead at 3030 Peachtree Road NW. Featuring six floors and commanding nearly 70,000 total interior and exterior square feet, this revolutionary new retail concept features dramatic interior and exterior installations of home furnishings in a gallery setting. "Our vision is to create a space that blurs the lines between residential and retail, indoors and outdoors, online and offline, and celebrates both the creative past and present of Atlanta," says RH Chairman & CEO Gary Friedman. "The Gallery at The Estate in Buckhead is a study and reflection of human design in regards to balance, symmetry, and proportion, while respecting the integration of environment, architecture, and humanity to create a feeling of harmony." "Our goal is to transform the traditional retail model from a way to shop to a way to live," Mr. Friedman continues. "Most shopping centers and retail malls are archaic windowless boxes, lacking any sense of humanity." Mr. Friedman concluded, "We don't want to change the face of retail, but rather give it a soul." RH Atlanta sits on nearly two acres and marks Friedman’s continued collaboration with design architect James Gillam of Backen, Gillam & Kroeger, a firm recognized as one of Architectural Digest’s Top 100 architect and design firms in the world. Conceptualized as a contemporary version of a Southern estate, visitors will first encounter the Gallery’s majestic exterior featuring an expanse of windows with over 100 pairs of French doors and a 36-foot tall Entry Oculus with dramatic 17-foot gates set against a backdrop of charcoal grey Venetian plaster. The magnificent grounds – featuring indigenous mature Hightower Willow Oaks framing the east façade, Alta Southern Magnolia trees rising out of a continuous boxwood hedge to the north and south, and Dwarf Yaupon Holly – provide an expansive green composition year-round. Looking overhead, guests will see a progression of garden terraces featuring tracery metal trellises accented with climbing star jasmine, which culminate with the Rooftop Park & Conservatory. As night falls the building’s architectural details and gardens illuminate in a warm dramatic glow. Visitors approaching the main Peachtree Road entrance will pass through the striking gates into the grand entry rotunda with an antique French cast iron fountain discovered by Mr. Friedman and his team of Curators on a recent trip to Paris. Awash in natural light emanating from the open air oculus three stories overhead, this space will be punctuated by an elliptical dome and lit by a spectacular, 8-foot Foucault’s Orb Crystal Chandelier at night. Guests will then arrive at a two-story, arched glass wall before entering the central hall with an interior atrium rising through the space. All of this will be experienced along a single visual axis, enabling an unobstructed view through the entire main floor to the outdoor Estate Gardens and reflecting pool. At the periphery, Palladian-inspired barrel-vaulted passageways will lead to a classical arrangement of rooms with outdoor courtyards, featuring collections from renowned designers and artisans across the globe. Arriving via the estate’s rear entrance off Buckhead Avenue, guests will first experience the impressive Estate Gardens and motor court with valet parking. Atop a canvas of decomposed granite, symmetrical rows of towering Bosque Elm trees – each set within an organic planter of clipped boxwood – flank both the drive and the 50-foot-long infinity reflecting pool. Intimate, open-air pavilions lush with fig ivy, billowing shade canopies, glimmering chandeliers, trickling fountains and a monumental fireplace will showcase the most comprehensive and dramatic display of RH Outdoor furnishings to date. Continuing their journey indoors through each level of the Gallery, visitors will ascend a six-story, grand double staircase spanning 36 feet, with custom-designed iron handrails inspired by the late 20th-century Venetian architect, Carlo Scarpa. A spectacular installation of 36 beaded crystal chandeliers hanging nearly 100 feet overhead plays off mirrored walls and windows to create an endless reflection, illuminating the climb to the floors above. The first three floors feature the largest expression to date of RH Interiors’ curated collections of Living, Dining, Bedroom and Bathroom Furniture, Lighting, Furnishings and Accessories. The brand’s first physical representation of RH Small Spaces and an RH Baby & Child gallery occupy the entire fourth and fifth floors at nearly 8,000 square feet each. Here, visitors will discover sophisticated children’s furnishings that blend seamlessly with the rest of the home and petite versions of the brand’s iconic sofas, sectionals and chairs in a progression of intimate, light-filled rooms. At the top of the grand stair, guests will arrive at the Conservatory and Rooftop Park. This expansive space will first be experienced within a structure of glass and steel with 20-foot ceilings at its apex. Here, they will discover a one-of-a-kind destination with wraparound terraces featuring sculpted evergreen trees and topiaries, exotic succulents and panoramic views of Buckhead and downtown Atlanta’s skyline. At RH Atlanta, guests will also find a Ben Soleimani Rug Showroom displaying the fourth-generation designer’s exclusive hand-knotted and hand-woven rugs and an RH Design Studio, where they can work with the RH design team, their personal architect or interior designer, or schedule an in-home consultation. RH Atlanta, The Gallery at the Estate in Buckhead will offer complimentary valet parking, and can be reached at 770.804.9040. Hours of operation are Monday through Saturday from 10am to 7pm, and Sunday 12pm until 6pm. This release contains forward-looking statements within the meaning of the federal securities laws. You can identify forward-looking statements by the fact that they do not relate strictly to historical or current facts, including any statements related to our goal to transform the traditional retail model, visitors’ experience and gallery offerings. Forward-looking statements are subject to certain risks and uncertainties that could cause our actual or future results to differ materially from our expectations. For further information regarding risks and uncertainties associated with RH business, please refer to the risk factors section in the Company's SEC filings, including, but not limited to, its annual report on Form 10-K and its quarterly reports on Form 10-Q. RH undertakes no obligation to update information contained herein, including forward-looking statements.